My first job at the University of Washington was in Meany Hall. When I walked into Meany for the first time, I was amazed at the size of the lobby — a huge space with several levels and a soaring balcony. But I was not impressed with the materials the architects used for its walls — brutal brick and raw concrete. The space reeked of the sparse International style of the 1960s and early ’70s. I missed the ambiance of a festive performing arts center — ornate plaster walls, brass chandeliers and lots of red carpet. There was a carpet, of course, but it was not red. I was not sure what I thought about its color scheme — blotches of hot pink, maddening magenta, overwrought orange colliding with each other in what looked like a hangover from a 1960s acid trip. At least it brought life to the cold, empty space, I thought. Over the years, the University brought more life to Meany, filling its walls with great artwork. I had the pleasure of escorting Art Professor Jacob Lawrence on a tour of the lobby one afternoon — he was looking at spaces for a mural he was going to make — when the taciturn artist said to me, “That is some carpet.” Months later he unveiled his piece, titled “Theatre,” and his color palette seemed to ignore the raging tones on the floor beneath. Time took its toll on both the building and the carpet. Sunlight washed out the shock of the pinks and magentas. Leaky skylights dripped rainwater on the fabric. When the exterior was renovated in the mid-1990s, the UW decided to replace the carpet as well. To my surprise, they chose the same fabric designer responsible for the acid-trip carpet — Jack Lenor Larsen. I found out that Larsen was a 1949 graduate of the UW and a legend in the world of design. Carpet, upholstery, and curtains at some of the world’s most famous buildings had come from his studio. They graced the space of the United Nations Building, Frank Lloyd Wright’s Fallingwater and even an exhibit at the Louvre. I wondered what he would come up with this time. When Meany opened its doors in 1996, there was plenty of drama in the lobby as well as on stage. The carpet was extraordinarily beautiful. Somehow Larsen had taken Meany’s odd curvy space and organized it with a grid of clear colors — red, gray, yellow and orange. There was plenty of color but it was a more classic palette. Even Lawrence’s mural seemed happier. 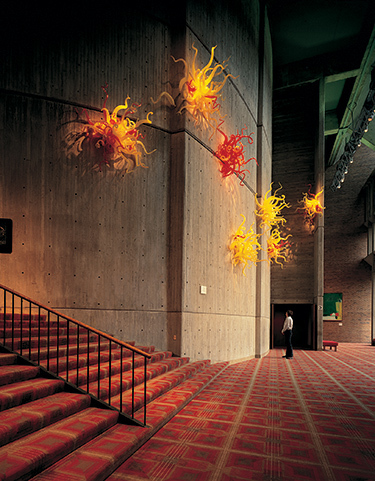 The new glass sculpture by Dale Chihuly seemed to pick up Larsen’s tones. Which made me wonder if I was too judgmental about the original carpet in Meany after all. The talent of a great artist is to challenge the status quo, to make you see the world in a new and different way. Larsen’s magic carpets and fabrics have been doing that in Meany — and around the world — for more than 50 years. Tom Griffin is the Editor of Columns.